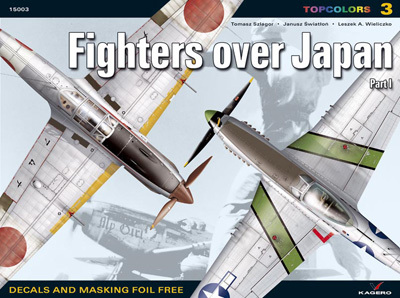 Emblems of units – Sentai (air groups), Dokuritsu Chutai (autonomous squadrons), Kyodo Hiko Shidan and others – were painted on tailfins and rudders. Sentai badges were painted in colors assigned to component Chutai (squadrons). Aircraft flown by Sentai­cho (commanders of Sentai) and Chutaicho (commanders of Chutai) were usually additionally marked with colored bands around rear fuselage. Tactical numbers – often last digits of serial numbers – were usually painted on rudders and/or landing gear wheel co­vers. Individual markings were rare. Sometimes there were decorative stripes painted along fuselage sides (often in form of a stylized lightning) or initials applied to rudders. Victory markings were seen only exceptionally. Basically, only the aircraft of the best and most famed pilots sported them. Suicide attack units known as Shinten Seiku-tai (which can be translated as “the ones who shake the sky”), which in late 1944 were created on orders from Shosho Kihachiro Yoshida (the CO of 10th Hikoshidan) and tasked with ramming B-29s, could usually be identified by their red tail units or red stripes painted along fuselage sides.